People seem to think credit scores are really important. I guess I haven’t really seen the value so much as a grad student who isn’t taking out any mortgages, though it probably had an impact on my auto loan a few years back. But I trust the finance people, it’s probably something to be concerned about when it comes to borrowing money for a car, a house, or a bikini. But really, I just like metrics of any kind, so of course I became interested in credit reports. 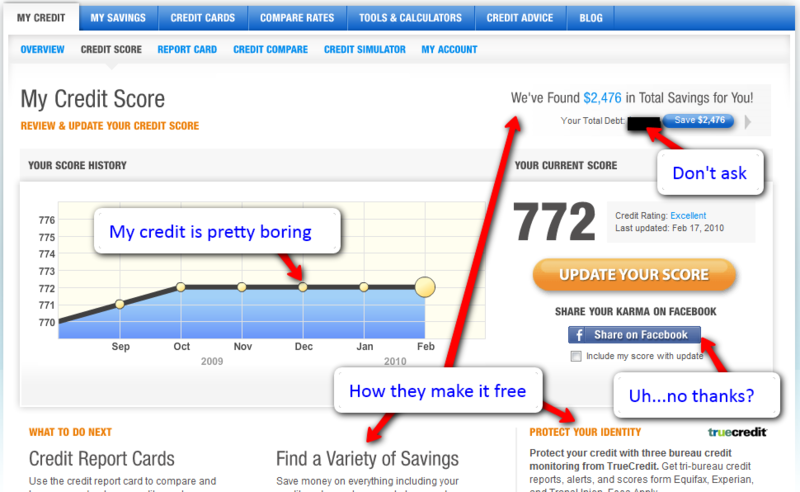 Prior to discovering CreditKarma, I used to get 3 free credit reports a year using annualcreditreport.com (note: don’t fall for the catchy jingles, freecreditreport.com is a scam). The basic idea is that each of the 3 major US credit reporting agencies is required by law to provide you with one free credit report a year, so I just made a note on my calendar to check a specific agency every 4 months. But this doesn’t give your actual credit score, just a report of your current number of accounts and a history of bad things you may have done. You usually have to pay some extra fee to get the score, unless you want to play a game of chicken with cancellation deadlines (which I’ve done before). But I’m done with all that now that I’ve found CreditKarma. CreditKarma is sort of like a Mint for your credit score. You have to enter your credentials once (name, address, social security number), and then they’ll track your score on a monthly basis (but they’ll also check it instantly at any point that you want). It’s important to note that these aren’t “hard” credit inquiries, so they don’t hurt your score. It’s also important to note that a lot of people are afraid of identity theft and martians and other crazy stuff, but the company seems pretty reliable to me. Beyond quantifying your fiscal dependability in a single number, CreditKarma also provides some nice reports breaking down the individual areas that contribute to that score. They give you a letter grade and a percentile ranking relative to the rest of the herd, helping point you in the right direction to bring that score up to par. On top of that, you can run a “credit simulation” to predict how your credit would change based on a range of choices (paying off your loan, getting a new credit card, selling your soul, etc.). Ok, maybe not that last one. Anyway, all of this is pretty nice, with the only real catch being the targeted offers they show you. Fortunately, there aren’t any annoying pop-up ads, so it doesn’t really hurt the site’s credibility much…which I guess is good for a credit scoring site.